This driver didn’t want to wait for a moment behind this group of cyclists. Unfortunately that impatience saw him come unstuck pretty fast. A group of cyclists in Australia had a lucky escape when a motorist was taken out by a truck right beside them. The group was stopped at traffic lights when the driver behind them decided he didn’t want to wait. Initially, the motorist began beeping at the cyclists. He then nudged out into the next lane in a bid to overtake and get ahead of the riders to go straight through the junction. Unfortunately a truck was coming up the left. And despite efforts to avoid the car veering into the truck driver’s path, the vehicles inevitably crashed. The riders were right beside the impact but thankfully the car was pushed slightly forwards on impact, rather than sideways and towards them. 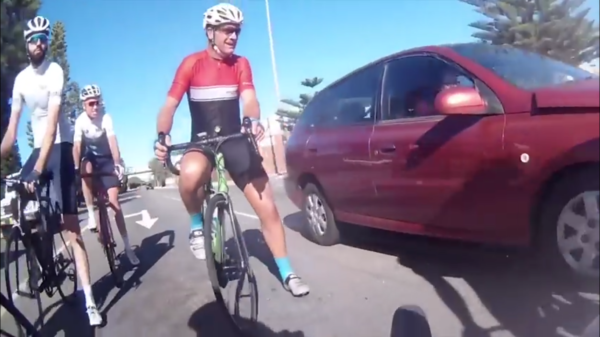 “We were turning right at the traffic lights and so were in the turning lane,” one of the cyclists told PerthNow of the incident in Freemantle. “There was a red arrow, so we couldn’t proceed through the intersection. A car came up behind us and began to beep at us because he wanted to go straight through the intersection.